Founded by Master Tao Huang, Ascending Hall is a Taoist temple, through which the timeless living teachings of the Tao can be transmitted to those of earnest heart. As the present planetary and solar initiatory cycle draws to its inevitable close, Ascending Hall no longer functions under the commonplace student-teacher mystery school model of the past, as the time for such is now completed. In the practical sense, our work today offers healing integration of body, mind, and spirit through the expediency of Taoist Inner Alchemy --available publicly, and more intimately through private appointments and/or workshop gatherings. We are a friend to all, yet follow Spirit foremost, serving those representatives within the diverse, multi-cultural planetary family who are now drawn to stand together upon the innermost foundation of sacred teachings that are found well beyond the shadows of culturally-imposed religious, institutional, and social 'separative ism's' -- in devoted service to all. Our activities have undergone many changes over the last year and are still being re-shaped in ways we cannot always foresee. Bookmark your favorite sections of the site and check back at regular intervals to see what is new. Mountain SKYLIGHT Journal - devoted to sharing the highest vertical vision of I Ching has resumed quarterly publication online, in e-zine format. 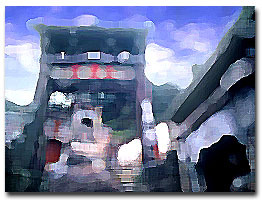 Lingusitic Image, Public Archives, and Dear I Ching are freely shared. 2007 initiated face-to-face Spiritual Anatomy workshops for those interested in refinining the energy bodies as instruments of service. 2008 brings an expansion of this unique program with more workshop opportunities and optional retreats at certain intervals. 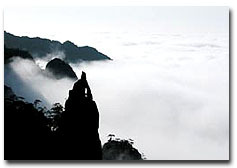 Our online bookstore, jadewinds, continues to offer materials that can aid awakening to the Tao. All proceeds from jadewinds goes to support Ascending Hall's work, publications, and activities. Your support is sincerely appreciated should you find a book or item of interest or wish to make a helpful donation. Master Huang continues to travel the United States and abroad to promote Ascending Hall's work. His newest book, Angelic Wings, will be available in December, 2007. He is currently writing Landscaping the I Ching, for 2008 publication.